"As Above, So Below" Pendant. Sterling Silver. Smaller than a quarter about an inch across, good for women or men, solid but not too heavy. Chain recommendation, medium box. This name is an old saying signifying that all things are agreed upon and in proper order. 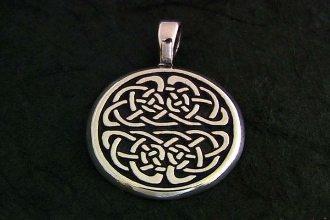 This original design is a modification of a traditional "half circle" knot made into a whole by mirroring and reflecting the Heavenly (above) with the Earthy (below). I was captured by this concept while hiking the Wicklow mountains, and coming across a perflectly still lake, which flawlessly mirrored the hills and sky behind. All things were indeed in agreement on that day.